Do you like this grand old lady of a sewing machine? It was given to me by my mother, who got it from a church fair when I was small. It's electric, with foot controls, but it must have been one of the first! If I want to do anything other than sew straight forward and back there are a number of different feet that can be put on. As far as extras go I've only tried the zigzag foot, and it was a pretty grim experience. But I love it. It's metal, and solid, and heavy, and feels ever-lasting. It is 'Made in Great Britain' and the instructions are written in clear, fine English. However that's just a stop-gap measure: a couple of years ago I bought fabric to sew into roman blinds for all our bare windows. I made one for the similarly cold glass panel next to the front door, recoiled in horror at how long it took me, and how perfect it didn't look, and there it ended. Recently, though, I came across this blog with simple instructions. So I started again. Still slowly. Soon I will post photos of our new blinds. 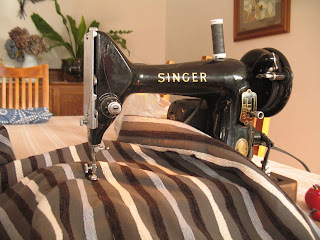 In the background of the sewing machine photo you can spot some folded blue and white fabric. That's the roman blind for our toilet. 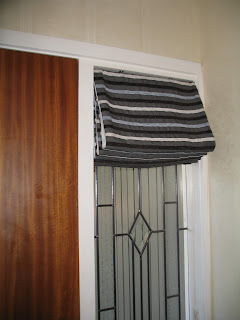 Both blinds are made and awaiting the revving of my husband's drill to fix the top battens above the door and window. Warning: the colours will look awful with our existing paint and wallpaper. When the wall colours catch up with the blinds, it will look great!